Yay...it's Tuesday...time for another release at Doodle Pantry. Every 3rd Tuesday, Doodle Pantry will be releasing cut files, along with a few images. I absolutely love working with these cut files. I have never had a single problem with any of the ones I've used. Lori McCroskey designs most of the .svg cut files for Doodle Pantry, but Laurie Wilson (owner of Doodle Pantry) is creating some of them too. They are fabulous. 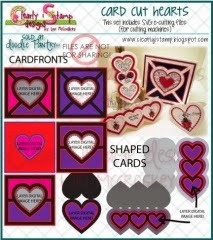 For my card, I chose to use the new Valentine Mice image set and Card Cut Hearts svg set. I started by printing the mouse with balloon pre-colored image onto white card stock using my Cameo and doing a print and cut. I had to manually cut the space inside his tail area using an xacto knife. The white, purple and pink layers are all from the Card Cut Hearts set, with the white layer being the card base. I love doing shaped cards and this one is adorable. I printed the sentiment on pink card stock and did another print and cut with my Cameo. I just love this stacked heart card. It was so simple to use. I added heart and circle crystal stickers on the sides and a crystal strand sticker for the balloon's string. I finished by popping the image up with foam tape. Here is what you get in both sets. There is still time to join us in our new challenge on the Doodle Pantry Blog called Ants in My Pantry Digital Challenge. It begins on the 1st Tuesday of the month and runs for 3 weeks. You must use a digital image, but it does not have to be from Doodle Pantry. One winner will be selected on the 4th Monday of the month and will receive a $15 gift certificate to Doodle Pantry. Such a FABulous shape...LOving your colours too. Thank you soooo much for joining us this week at QKR Stampede. Great shape, color and image. Thank you for sharing this lovely art with us at Word Art Wednesday. hi Susan! This is super cute. Thanks so much for sharing with us, and please come by to play along again soon. Absolutely gorgeous, Susan. Love how you combined Card Cut Hearts with the sweet image. You really are a master of your die cutting machine. Just ADORABLE!! That cute little image just made me smile. I love how his feet kinda dangle - what a chuckle!! Great design and layout too. LOVE it! So cute and colored so nicely too! This is so cute and colored beautifully. Thanks for joining us this week at QKR Stampede for our Cupid Challenge. Super cute card! Thanks for joining us for "Anything Goes" at Creative Cutting Challenge. What an adorable card! I love the stacked hearts shape and that sweet little mouse. Fabulous eye catching colour scheme. The little hearts make me smile :) Thanks so much for joining our Anything Goes Challenge at Craft Your Passion. I hope we see you again soon. Love Deedee digital sets and this one is adorable. Thank so much for joining us at Though the Craft room Door challenge. That is such a cute image, and it's beautifully coloured.